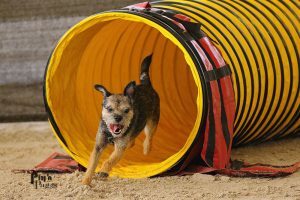 Has your young dog already had some agility training, either in a class or at home? Then this class may be for you. And it’s not just for young puppies, it’s for your teenager! This class will be held outdoors.~ Prerequisite for Puppy/Adolescent Agility 2: graduation from the Puppy Agility Fun class, Intro to Agility, Fido Fun & Games: Agility Edition, or approval from instructor or Training Director. 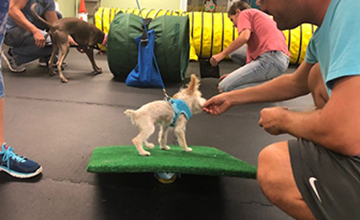 To join this class if you have not taken one of the recommended classes, your dog should be confident on a wobble board, and familiar with the tunnel, tire and table. Your dog should be coming to either your left or side on cue. The difficulty level will be personalized to your dog’s (and your) skill level. This class is only for friendly, non-reactive dogs. In this class, you will learn lots of new skills and continue to work on obedience skills for agility. Agility obstacles such as A-frame, dog-walk, and teeter at low heights will be taught to give your young dog confidence and with safety in mind. Open channel weave poles will be used and we will work on front and rear crosses. The dog’s correct position relative to the handler will be stressed, as well as teaching the puppy the confidence to begin working away from the handler. Short sequences will be run using obstacles such as the table, tunnel, and open weaves. No (or only very low) jumping will be done with pups under 12 months of age and older adolescents over a year will begin to jump higher. Register early to guarantee a spot in class. If you have any questions about signing up for either puppy agility class, please contact Mindy Cox, Training Director at 561-427-6700.